This mako shark threw itself onto a boat off Texas on Sunday. Leaping sea creatures: Do we need bigger boats? Last Friday, a 300-pound eagle ray leaps onto a boat off the Florida Keys. 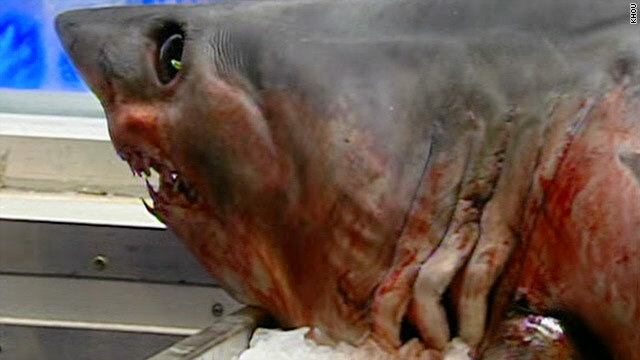 On Sunday, a 375-pound mako shark jumps onto a boat off Texas. What's up with the leaping sea creatures? Has Aquaman's telepathic message been scrambled? Are the buddies of "Jaws" seeking revenge? Are we going to need bigger boats? Actually, "many ocean animals do jump out of the water when either chasing prey or trying to elude a predator," Timothy J. Mullican, vice president of zoological operations at the Georgia Aquarium, said in an e-mail to CNN. And the eagle ray and mako shark are both known jumpers, he said. But plopping on a boat is far from the usual result, he said. In the Florida case, "the presence of the boat may have spooked the eagle ray, or it may just be a one-in-a-million intersection of boat and animal," Mullican said. And off Texas, "the shark could have conceivably been accelerating through the cloud of 'chum,' broken the surface and unfortunately found a boat occupying the space where it was going to land," Mullican said. On landbigfish.com, fishing guide Dennis Dobson also provides a few ideas why free fish - those yet to taste the hook - jump. Females may be trying to loosen eggs for spawning, he says, and both sexes may be trying to rid themselves of parasites. Or, he writes tongue in cheek, they may be just "flipping the fin" to fishermen. If that's the case, then some fishermen have figured them out. They count on their catch leaping aboard. The book "Fish Catching Methods of the World" describes how fishermen in several countries rely on fish behavior instead of hooks and nets. And leaping aquatic creatures aren't only found on oceans, rivers and lakes. I know this from personal childhood trauma. That goldfish gasping for oxygen on my childhood bedroom floor didn't jump from its bowl with a death wish, my parents assured me. That was just what fish sometimes did. And while last weekend's two incidents were obvious shockers for those on board the two boats, imagine if a great white shark plopped onto your bow. That's exactly what happened to some German tourists off South Africa a few years ago. Get their view here. In South Africa, the great white got away. And the Florida ray was set free. But things didn't end so well for the Texas mako or my goldfish. That is a really scary looking animal man! Damn! I am so sad that this beautiful creature had to die this way. When I worked in a pet shop, I would come in the morning and have to pick up dead fish of the floor. If the tanks aren't covered, or heavy enough, they get out. Some fish are natural jumpers. Also, sick fish tend to "Beach" themselves. When my fish get sick, they always try to jump out of the tank. It's like when dogs, cats, etc, get sick and take off, or hide in the house. One of your worst articles yet CNN! Keep it UP!! !